What type of free trial should I offer for my software? Once upon a time, the idea that you would allow people to try your software before they bought it was revolutionary. But now, thanks to the shareware movement and the ease with which software can be downloaded from the Internet, free trials are the norm for most types of off-the-shelf software. Prospective customers no longer have to rely on reviews of questionable independence or reading the packaging in a shop. They can try the software for themselves before making any commitment. This has been overwhelmingly a good thing for software users. It has also been a boon for vendors of good software. When I surveyed 92 small software product vendors in 2009, 100% of them offered a free trial. Every small ISV today should give its customers an opportunity to try before they buy. It is officially now absurd to do otherwise. Customers will come to your Web site and expect to find a demo download. So, for most software products, the question isn’t – should I have a free trial? The questions is – what sort of free trial should I have? As with everything related to marketing, it depends. There are many different approaches. Below I describe some of the more common ones. Typically this takes the form of a fixed number of contiguous days of free and unrestricted use. The software then stops working and you need to buy a licence to continue using it. The time period is often 30 days. 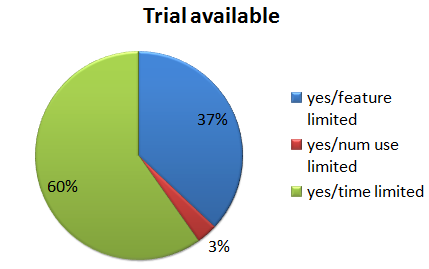 As you can see in the pie chart above, this was the most common type of trial in my survey. The trial might expire before they have finished their evaluation. It isn’t suitable for software that might only be needed for a limited time. For example, a 30 day time-limited trial wouldn’t be a good idea for my wedding seating arrangement software as a wedding is a one-off event (we hope), and people could just start the trial 30 days before their wedding. You have to find some way to hide the data about the date the trial starts. It is relatively easy to circumvent. Even if you hide the install date well and check for changes to the system clock a potential customer can just keep reinstalling the software inside a new virtual machine each time the trial expires. Cookie expiration is an problem. For example, Google Adwords conversion tracking cookies only last a maximum of 30 days. So Adwords conversion tracking won’t count a sale on day 31, which is probably where most of your sales will happen with a 30 day trial. As most sales will only happen after your trial expires, you will have to wait longer to get your money. Only limit the amount of time they are actually actively using the software. For example, allow them 8 hours of total active usage. This shouldn’t be too hard to program. For example, stop the timer if there hasn’t been a key press or mouse click event in 2 minutes. Allow them to request an extension. Then at least you have got their email address and can follow them up. In this approach you limit the number of times a certain action can be performed. For example the number of pages they can print or the number of times they can start the software. This avoids the issue of a time-limited trial which expires before the user has finished their evaluation. In this approach the trial disables an important function of the software, for example printing or saving. The problem is that a user won’t know if this feature works properly until they buy the full version. This may put some people off. It has the advantage that you can ship a separate trial version with features missing completely from the executable, which makes life a little harder for crackers (note that they can still get hold of the non-trial version to crack if they want to, e.g. with a stolen credit card number). But it also makes life harder for customers, as they have to install the software a second time after purchase. Personally I care more about making life easy for my paying customers. A capacity-limited trial restricts the amount of data that can be entered. For example, a password manager might only allow you to enter 50 passwords into the trial version. This approach can be problematic when performance is important. For example, if you limit a database trial to one thousand records, how can the user test whether the search performance is adequate for a database with a million records? Many products exist purely to produce some form of physical or electronic output, for example image editors and label printers. Adding a watermark, or altering the output in some other way, can be an effective way to limit a trial. But you need to make sure that the modification to the output can’t easily be removed or worked around (e.g. using screen capture). You also need to be sure the user doesn’t think the modifications in the output are due to a bug in the software. Nagware allows you to use the software without restrictions, but ‘nags’ you periodically to pay for it. Usually this takes the form of a window that pops up when you start or exit the software. But I once used some software that also nagged you in audio. A woman’s voice with a heavy Scottish accent no less. It got uninstalled very quickly! Nagware isn’t very effective in my experience. I never did buy WinZip. Did you? After a while you just click the ‘continue’ button without thinking about it. Little tricks, like moving the ‘continue’ button or greying out for a few seconds are just annoying. And annoying people doesn’t seem like a great start to a business relationship. Some software has no trial, just a money back guarantee. If your software is an enterprise system that takes significant effort to configure, then this is entirely understandable. But if it is off-the-shelf, downloadable software, what are you trying to hide? On the plus side it avoids the issue of people downloading software and then never getting around to trying it. My own stats show that only some 40% of people who start a download of my software actually install and run it. Also many people won’t ask for their money back even if they don’t like your product. So you might get sales to people who wouldn’t have purchased with a trial. But do you really want these people as customers? Personally I am unlikely to buy a software with no trial, unless there is no real alternative. I assume you won’t let me try your software because it isn’t very good. I’m sure many other people feel the same way. Hybrids of the above approaches are also possible. For example, the trial of my wedding seating arrangement software doesn’t allow you to save, print or export plans with more than 30 guests – a hybrid of the capacity-limited and feature-limited approaches. I figure that 30 guests is enough to show what the product does, but not enough to be useful for most events. Also no-one is likely to pay for event planning software for an event with 30 or fewer guests. A good trial is a balancing act. You need to give prospective customers enough to show them your software could solve their problem, but not enough to actually solve their problem. But if you are too restrictive they might go to a competitor with a more relaxed trial policy. It can be tough to get the balance right or to know whether a different approach would get better results. 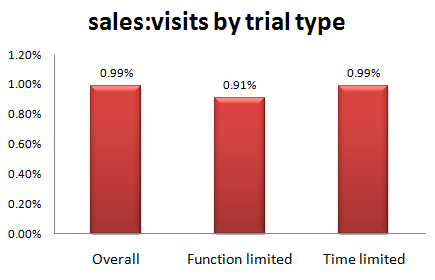 Obviously, the best type of trial depends very much on your product. If it is a product that is likely to be used a lot and is going to increase in value as it is used, then you might be best offering a generous time-limited or usage-limited trial. But if it is a product that is only needed for a one-off task or a limited period of time, then a feature-limited, capacity-limited or output-limited trial probably makes more sense. For example, most consumers will (unless they are very unlucky) only want to use disk recovery software once. So it wouldn’t make sense to offer a 30 day free trial. It would probably make more sense to offer a feature-limited trial that allows them to see what data could be recovered, but not actually allow them to do the recovery until they pay up. But if you are selling to professional disk recoverers, then a time or usage-limited trial might be appropriate. That goes back to competing with all the other products out there. If someone installs two programs to evaluate, and then doesn’t have a chance to really try them out until a month later, the one that works is more likely to get the sale. It also makes it more likely that potential customers will learn the application and start relying on it, so when it does come time to pay they’re less likely to throw out that investment and switch to another tool. Patrick McKenzie reports on an A/B test of nagware vs feature-limited versions of the same software, showing the feature limited version had a 5 times higher conversion rate. A poster on the Business of Software forum reported that a bug which accidentally turned his trial from feature-limited after 30 days, to feature-limited as soon as it was installed, increased his conversion rate by 33%. The nagware vs feature-limited result is fairly conclusive. But, apart from that, there doesn’t seem to be much hard data to go on. Even if there was more data, it wouldn’t necessarily apply for different products in different markets. So, unless you want to program multiple types of trial and run lots of split tests (trial and error? ), you are going to have to ‘go with your gut’. It is tempting to pick the same trial model as your competitors. But remember that part of successful marketing is being different. So there are no easy answers. But don’t just choose a 30 day time-limited trial because that is what everyone else is doing. Have a think about what fits best with your product, market and customers. Be creative. This entry was posted in article, marketing, software and tagged download, feature limited, free, nagware, software, time limited, trial, watermarked on 19 September 2011 by Andy Brice. I offer a “30 individual days” trial for my Source Search product. I’ve never received any negative feedback for that (unless you count “It should be free”!) and I’ve had people comment on how much they liked it. Excellent analysis and well articulated summary. Software Candy is using the “buy before you try” type, entitled in your article as “no trial”. In other words, we offer the full product without any limitations or “time-bombs”, so that the user can experience and evaluate the benefit *immediately* — and, if she or he is not happy with it for any reason, a full refund is promptly issued. (1) Our apps are single-function *by design*, typically fixing a single problem in the PC. Canceling their effect after a certain amount of time, reminds us too much of malware behavior… We prefer the more direct and ethical approach. (2) This approach also eliminates wasting time on cumbersome, annoying and useless copy protection schemes. (3) Statistics suggest that less than 1% of downloaders end up purchasing the product. Why bombard the site (and bandwidth) with sterile traffic? (4) We get to keep only the happy — and honest — customers. We do have one product, available on Android markets and Amazon appstore only, that uses the “feature limited” type. So far, it has only confirmed the validity of our approach. MTG Studio of mine has 30-days trial. All positive clients about this. I don’t plan changing it. Is there a place to continue voting for this. I would like it grow as a statistic over time. You mentioned Beyond Compare’s 30-non-contiguous days trial – that’s exactly why I bought it (well, that and the fact that it’s a great product). I figured that guys who have an evaluation policy like that deserve my money. Vote with your wallet, it works. I run a 10-day trial. I chose 10 days because I figured 30 days was too long and people forget they installed or forget to install. So a shorter period increases the urgency. I figure that as soon as they work out the software works, they should know if they are going to buy it. Trial extension requests are granted without question. At the end of the trial it reverts to nagware, with a link to the purchase page. But because it’s web-based software that the clients’ customers get to see, that one link accounts for about 30% of all conversions through my site (there are resellers, so the overall conversion is lower). As soon as the trial completes the purchase follows pretty much straight after. I get positive feedback on the system – I think most customers feel it’s fair enough and allows them to really try out the software before making a commitment. I guess nagware could be effective when it is ‘customer facing’ software, i.e. that the potential purchaser is going to show to *their* customer. We restrict the number of records you can store in the database. It gets around the time limit issue and gives the user chance to explore indefinitely until they make a decision. Oh, forgot to mention. Great article! My experience of switching trial types was extremely positive. Back in 2008/9 I switched from a 30 day trial to limiting the output, the result was around a three fold increase in sales. Looking back it’s a no brainer, many people on a 30 day trial use our product to see their website is fine now, imagine it will be for a good while & then forget about the product. Your software needs to be good. I’ll give you a concrete example: RubyMine. This is a paid alternative to the free NetBeans. For only $110 (I think), we wouldn’t think twice about buying it – as a counterpart to the awesome IntelliJ. Their mistake? They let us try it for a month. It’s not a terrible product, but it’s definitely not a good IDE. Perhaps it’s too young; perhaps the language is inherently difficult to provide useful tools for; I don’t know. But if it’s not *good*, why would I spend my company’s money on it? Also, nagware sometimes works. If It’s not too naggy. RubyMine reverts to NagWare after the trial period – that quits after 30 minutes and reminds you to buy it when you start it. That’s *annoying*. However, take for example Total Commander. This is an extremely useful tool – but it truly takes years to get used to. I used it for probably 3 years in trial mode. But then I joined a company and got them to buy me a license. After a few years I joined another company and got them to buy me a license. And the nag ware bit? I would never have bought it in a million years at the time. But it wasn’t too annoying to stop me from using it – and that’s what got them two conversions.